Montreal based artist, FONKi, stood back to get a better look at his mural as he takes part in the mural festival. LYNN — The stories of Lynn’s people are being immortalized in its walls. For the past week, brick facades downtown have dripped with color as artists from around the world turn buildings into canvases. 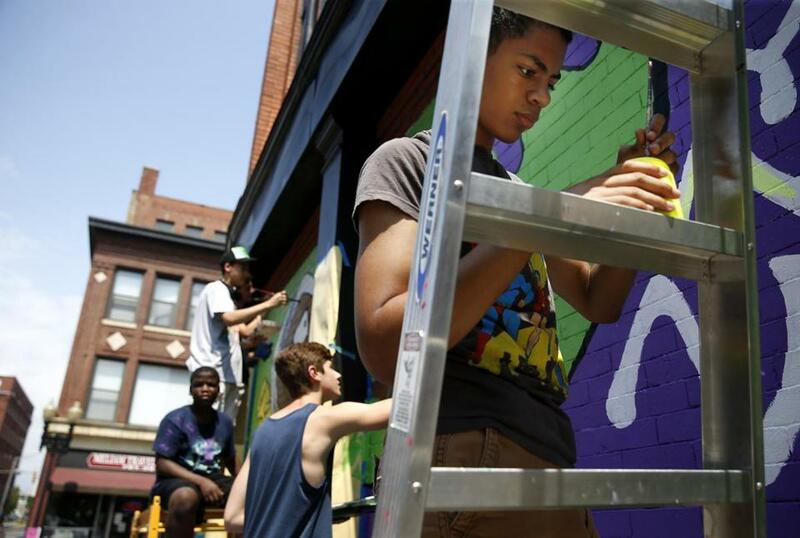 On one block, Boston muralist Caleb Neelon created an interconnected quilt. Inside the cross-section of technicolor patches are messages from people Neelon has met in the community. “I love my Mom” said one patch. Another featured the face of a neighbor’s dog that has visited the artist as he works. Across the road, towering above the Monroe Street Farm, is the shape of a woman spanning the length of a building. The Cambodian graffiti artist from Montreal known as “FONKi” listens to piano music from the basket of cherry picker as he paints. Passersby ask if the figure represents. She’s a friend, he responds. An immigrant whose story of leaving Tunisia for Canada inspired him. She’s resilient, he said. So is Lynn. Aside from the 15 murals in progress, plans call for vintage neon artwork to be displayed in storefronts and mounted on buildings, dynamic LED lighting to be placed under MBTA overpasses, and the installation of a downtown sculpture of an original GE I-A Engine, the first jet engine made in the United States. It was made in Lynn in 1942. In partnership with the city, residents, business owners, corporations, civic organizations, elected officials, and volunteer committees, “Beyond Walls” applied for grant money and raised money to realize one of its goals: to reinvigorate the community and transform Lynn through art in the same way the Wynwood neighborhood turned Miami into a destination for street art. The artists have spent the week sleeping at dorms in Salem State University. The nonprofit paid each a $1,000 stipend and gave them $450 Visa cards to spend locally. Elijah Fernandes, right, worked with others on public art projects in Lynn. “You can’t ride the train past Lynn anymore without seeing what’s going on,” Wilson said. He’s not wrong. From the elevated, train platform, commuters can see Angurria, a Dominican artist working on Washington Street. His mural features a regal woman looking off in the distance, her hair in curlers. On Munroe Street, Puerto Rican artist Don Rimx takes a step back from his piece, which rises goes up several stories. In the haze of summer heat, his image of an indigenous warrior figure blowing into a shell contains religious elements of the Yoruba gods. That positive energy from local residents was apparent to a group of high school students known as the “Good 2 Go” crew with Raw Artworks, a local after-school program. Drivers honked and complimented their work. Cedric “Vise” Douglas, a well-known Boston street artist, placed a bench before his wall so watchers would linger. His mural of the black Madonna was created to appreciate the beauty of black women. One day this week, group of musicians set up near the mural and began playing. A crowd gathered and danced even after it started raining.